According to the World Health Organization, the incidence of cancer has doubled over the last thirty years (after allowing for the population aging factor). Over this period, the increase in leukemia and brain tumors in children has been around 2% per year. The WHO has observed a similar trend for neurological diseases (Parkinson's and Alzheimer's) and autoimmune disorders, and for reproduction dysfunctions. What explanations can be found for this worrying epidemic, which is hitting the "developed" countries particularly hard? Haunted by that question, director Marie-Monique Robin launches an in-depth investigation into everyday products and the system charged with regulating them. Robin digs through the United States Food and Drug Administration (FDA) and the European Food Safety Authority (EFSA) archives, manages to talk her way into secret meetings, and meets with regulators and respected renegade researchers throughout North American and Europe. The result is OUR DAILY POISON-a shocking documentary film that reveals a broken safety system concerned more with protecting trade secrets than human health. (In one key moment, a member of the UN agency responsible for setting acceptable daily limits of poisonous chemicals admits that the numbers are "theoretical" and have "nothing to do with the real world.") The film shows that the main cause of the epidemic is environmental: it is the result of the 100,000 chemical molecules that have invaded our environment, and primarily our food, since the end of the Second World War. The film is divided into three distinct, but interrelated sections, making it ideal for classroom use. In the first, Robin meets farmers suffering horrific health problems-such as leukemia, Parkinson's, and brain lesions-linked to pesticide poisoning, and looks into the effects those same pesticides have on people eating fruits and vegetables. Robin then moves on to the broken regulatory regime, using the artificial sweetener Aspartame as a case study. It is a cautionary tale about the revolving door between government and industry, and the influence of money on research findings. Finally, OUR DAILY POISON reveals the inadequacies of testing individual compounds in a world where everyone carries around a cocktail of synthetic chemicals absorbed from food and the environment-many of them mimicking the body's own hormones. 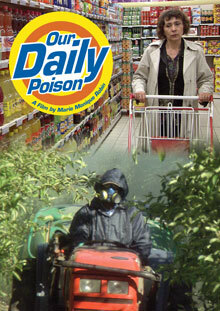 OUR DAILY POISON is a smart, well-researched and thoroughly compelling documentary that will reshape the way you think about everyday products and the systems that are supposed to ensure their safety. A visually elegant paean to the cultivation and harvesting of the sweet red fruit, and the disappearance of a traditional way of life in rural Japan. Reconstructs the long-forgotten murder of union organizer Frank Little in Butte, Montana, and draws a connection between the unsolved murder of Little, and the attempted murder of the town itself.